This is a consignment item. A 3% buyer's premium ($3.54) will be charged at checkout. It has been graded by MyComicShop's experienced graders. "Now Strikes the Hobgoblin!" Second appearance of the Hobgoblin. Script by Roger Stern. Art by John Romita Jr. (breakdowns) and Frank Giacoia (finishes). Cover by John Romita Jr. and Al Milgrom. It's the first fight between the Hobgoblin and the Amazing Spider-Man! And the all-out action begins after the web-slinger bumps into the new goblin at one of Norman Osborn's old hideouts! Spidey is very familiar with the goblin's bag of tricks! But the overmatched Hobgoblin doesn't have any idea about the wall-crawler's speed, strength, and agility! Is the Hobgoblin's criminal career going to be over before it even starts? An outstanding issue! Cameo appearances by Harry Osborn, Madame Web, Captain DeWolff, and the Black Cat. 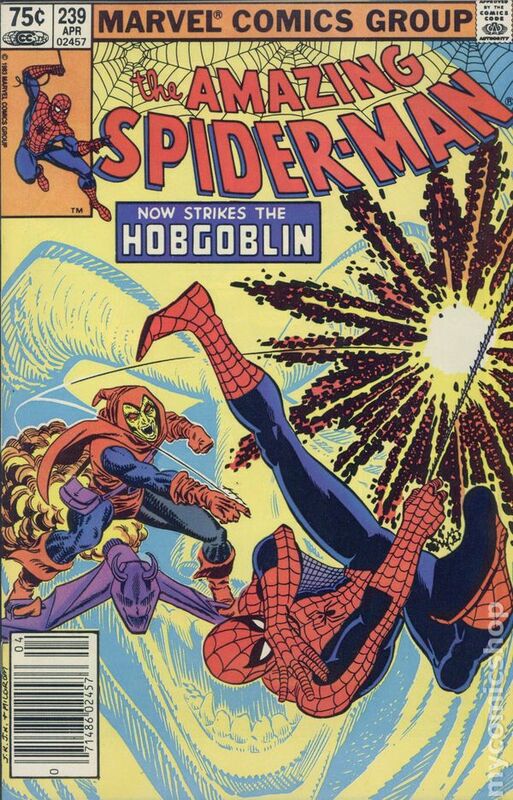 (Notes: The Hobgoblin returns in Amazing Spider-Man 244. This issue was reprinted in Marvel Tales 258.) 32 pages. Cover price $0.60. Mark Jeweler Advertisement Insert Variant. 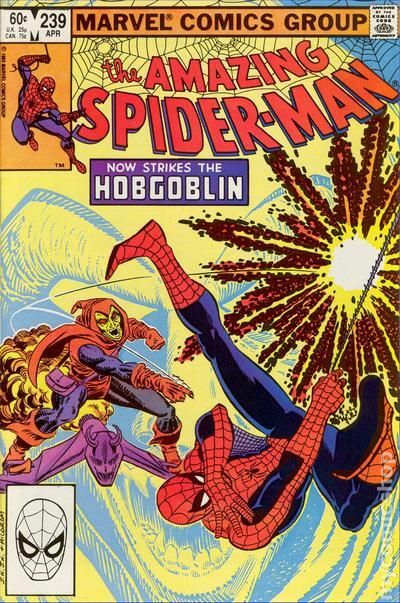 Second appearance of the Hobgoblin and first battle with Spider-Man in "Now Strikes the Hobgoblin!" Script by Roger Stern, pencils by John Romita Jr., inks by Frank Giacoia. Doctor Octopus and Madame Web cameos. Romita Jr./Al Milgrom cover. Cover price $0.60. Canadian Edition with 75¢ Cover Price. "Now Strikes the Hobgoblin!" Second appearance of the Hobgoblin. Script by Roger Stern. Art by John Romita Jr. (breakdowns) and Frank Giacoia (finishes). Cover by John Romita Jr. and Al Milgrom. It's the first fight between the Hobgoblin and the Amazing Spider-Man! And the all-out action begins after the web-slinger bumps into the new goblin at one of Norman Osborn's old hideouts! Spidey is very familiar with the goblin's bag of tricks! But the overmatched Hobgoblin doesn't have any idea about the wall-crawler's speed, strength, and agility! Is the Hobgoblin's criminal career going to be over before it even starts? An outstanding issue! Cameo appearances by Harry Osborn, Madame Web, Captain DeWolff, and the Black Cat. 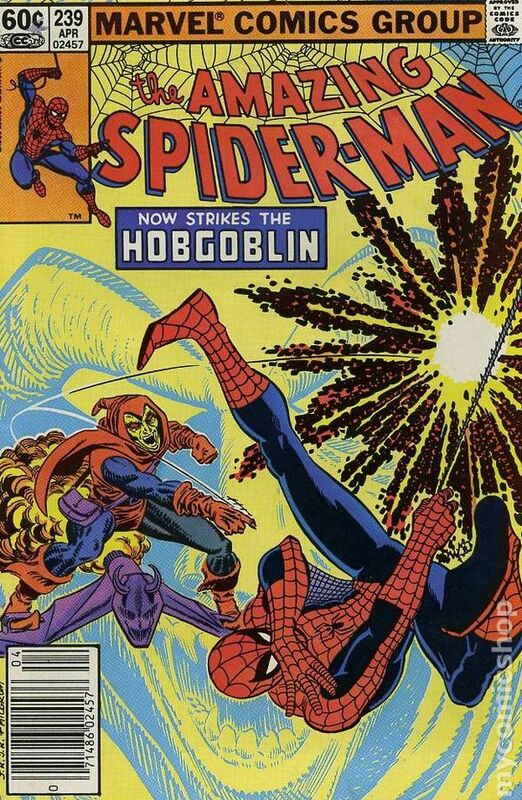 (Notes: The Hobgoblin returns in Amazing Spider-Man 244. This issue was reprinted in Marvel Tales 258.) 32 pages. Cover price $0.75.